The essentials for coffee making include a coffee maker, a grinder… but also a coffee scale. 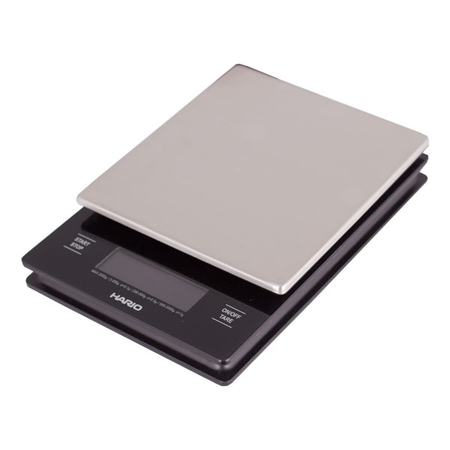 Why is a scale so important? A coffee scale makes for high precision and repeatable flavour of the brew. Looking for the right scale can really give you a headache, especially when you are confronted with cutting-edge models made for legit coffee geeks, so this is where we come in! We have prepared for you a review of the Timemore scale along with a comparison to the Acaia Pearl scale, its main rival. Timemore scale – a great first impression? It is a unique piece of equipment, featuring two weight sensors which enable us to measure not only the amount of water used for brewing but also the final brew. First, coffee geeks up for testing different brewing parameters. Second, baristas making coffee at coffee shops. Third, contestants taking part in barista championships where only the highest precision of brewing can result in a perfect brew. Aesthetically, already the first look at the Timemore scale makes you think of the Acaia scale and its modern, simple forms. A homogenous block with a display screen hidden under the panel surface, characterised by a minimalist and elegant design deserves recognition. The Timemore scale is smaller than the Acaia, but has an additional feature – a removable dripper stand which enables measuring the weight of extracted coffee. The Timemore scale is made with high-quality material, but, compared to the Acaia, its outer shell is of slightly poorer quality. On the other hand, it is clearly superior to the Brewista and Hario scales. The Timemore scale is sturdy and can be transported with no extra protection. Functions and additional features – what sets the Timemore scale apart? The Timemore scale had been made for true coffee lovers. What sets it apart from other scales is the above-mentioned possibility of calculating the total weight of water you pour into the dripper, as well as measuring the total weight of the extraction. For novices starting out on the coffee world such functions may prove too advanced; however, for coffee geeks and professional baristas, it is a new and unique piece of equipment bound to make devising new recipes easier. 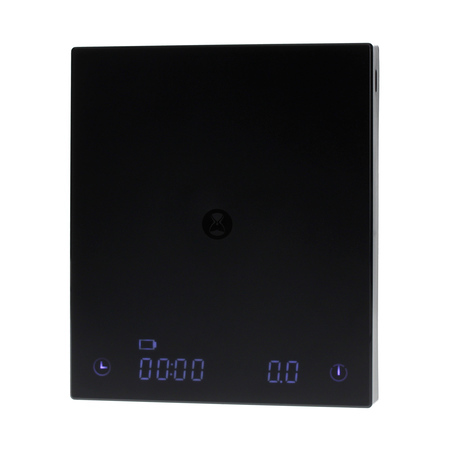 What’s more, there is an additional piece of data shown by the weight sensor, namely the flow rate; which is something different from the rate at which you are pouring water. Which gives you plenty of new possibilities to experiment with. The Timemore features a timer and a battery icon on the screen. It also has an AutoTar mode. For monitoring brewing, as well as for saving and evaluating individual extractions you can use a carefully designed application. The app can also be updated and paired with other devices via Bluetooth. 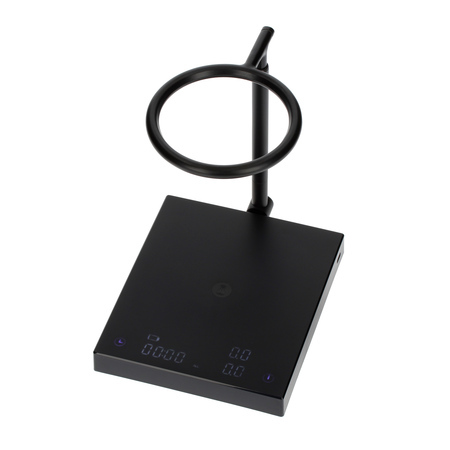 The scale comes with a USB-C cable; however, there is no charger to it. 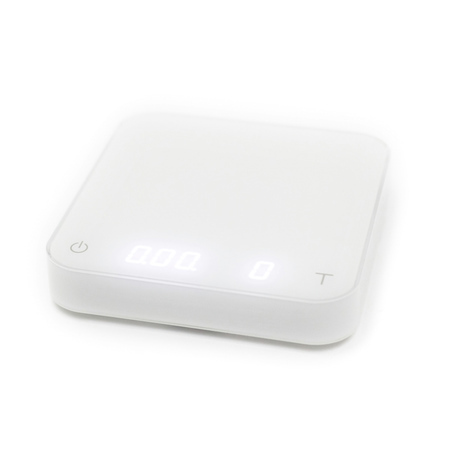 Alike the Acaia scale, the Timemore scale has an extra silicon pad protecting it from temperature effects. The silicon pad coming with the Acaia scale seems more suitable for that purpose, since it has a larger surface area and is more adhesive. 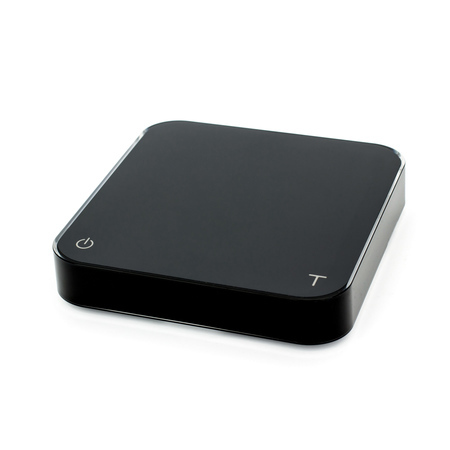 Fast response time and precision: the scale features a 0.1g sensitivity. Additionally, it has a 2000g max capacity, which allows many different uses. Until now the Acaia paremeters have been just the same. The Timemore has one additional property – it measures the extracted coffee up to max 1000g capacity. Adjustable height dripper stand: you can adjust it to whatever height you need, its arm can be turned to a horizontal position so as to hold, for example, a grinder. New possibilities: the scale allows many modifications and an insight into the brewing process, which until now has been out of reach to rival companies. Size: the base of the scale is small, saving space in the kitchen. Long battery life: the battery lasts long and charges quite fast. The USB-C cable is double-sided and fits easily into the jack (the manufacturer warrants that the Acaia lasts 30h per charge; for the Timemore it is 7h per charge). Well-designed application: it seems slightly more intuitive than the Acaia. 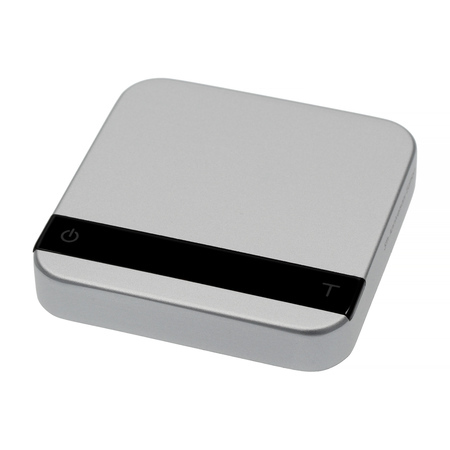 With the Timemore, it is easier to devise recipes and everything is more transparent. The Timemore application offers you the great possibility of labelling extractions with tags and adding your own ones, eventually creating a personalised database with short brew descriptions. It connects with the scale via Bluetooth in a split second. It is fairly difficult to remove the arm from the scale. The scale is rather loud. It’s not waterproof (the same goes for the Acaia). We don’t recommend using the scale when it is charging; the readout may be wrong. The Timemore Black Mirror, Dual Sensor edition, is an innovative appliance with a range of possibilities for analysing and experimenting with pour-over brewing. 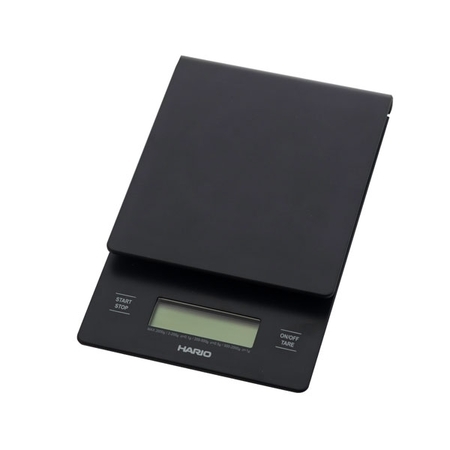 The scale offers an elegant design and is well-suited for gadgeteers and those who love experimenting with coffee. However, it may prove less useful behind the counter of a coffee shop, because it’s a fairly complicated device which can be time-consuming to use. And yet, in terms of functionality there is no parallel product on the market; so even if there are some flaws, eventually the Timemore scale is still unbeatable in its category. The Acaia Pearl scale, on the other hand, is a perfect choice for both home and coffee shop use. It is just as stylish as the Timemore. The block is larger and hence more comfortable to use; however, it takes up more space, be it in the kitchen or while transportation. The Acaia Pearl scale has a faster response time and seems to be more durable; hence it seems to be suitable for a heavy use. All in all, for coffee lovers which are not too keen on experimenting the simple Acaia will be a better choice. Hario offers reliable scales both for home use and for coffee shops: the Hario Drip Scale and the Hario Metal Drip Scale. Those scales may not have the highest precision or the best response time, neither do they have a dedicated application, but they work just fine on a day-to-day basis. They are good quality, practical, damage-resistant devices. The price too is to their advantage: the standard version of the Hario scale is half the price of the Timemore or Acaia scales. If you are not tempted by experimenting with the parameters and if you are not crazy about design either, the Hario is going to be the right scale for you. He is famous for his uncompromising approach to the quality of served coffee and being eternally second. Creator of the Arabean vlog, Polish Brewers Cup Champion 2017, V-ce Champion of Polish Brewers Cup Championship 2014/15/16, V-ce Champion of Polish Cup Tasters Championship 2016, 5th in the International Chinese Barista Championship 2016.